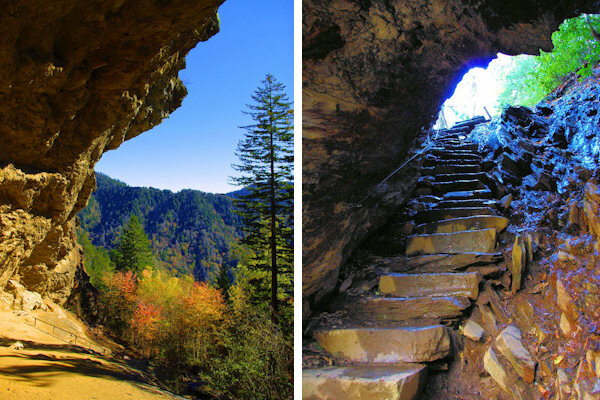 The Alum Cave Trail is the most hiked in the Great Smoky Mountains National Park. You'll see why, with its interesting geological features and stunning views. 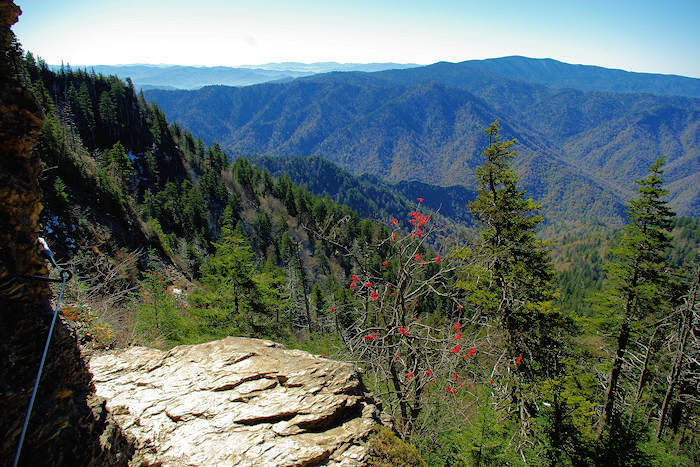 To reach the 6,593-ft. summit of Mount LeConte (third highest peak in the Smokies) from the parking area on U.S. Highway 441, you'll climb 2,853 feet in elevation during the 5.5 miles on the Alum Cave Trail. If you hike to the two best viewpoints on the summit, you will add almost two miles to your hike - a 13+ mile round-trip hike. Allow 6-9 hours for the hike. It's strenuous, but not technically challenging. Our hike took eight hours since there is so much to stop and enjoy along the way. At the top, we took a nice break at LeConte Lodge, the highest guest lodge in eastern America at 6,360 feet elevation. While overnight rooms book up many months in advance, they sell sack lunches to day hikers ($12/person), along with a variety of beverages and baked goods. Read more about the lodge below. Weather Tip: Mt. LeConte is covered in clouds and fog about 75% of the time and receives generous rain and snow. Snow is not uncommon from October through April at the summit. The first section of the trail to Alum Cave receives much less snow. The trail can be very wet, so hiking shoes are highly recommended. Temperatures at the summit run as much as 20 degrees cooler than the city of Asheville, so be prepared! 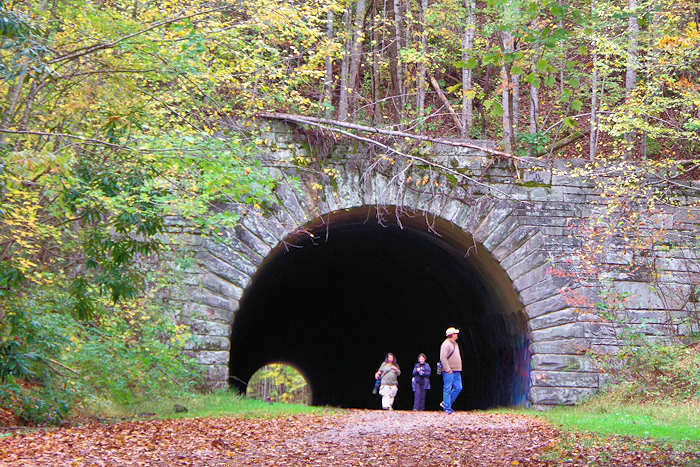 While the trail is open year-round, you cannot access it when Newfound Gap Road closes at times for snow and ice. Great news! A 2-year trail rehabilitation was completed in late 2016. At just over 1.3 miles into your hike, you'll reach Arch Rock after crossing a bridge over a creek. The trail goes under the arch with steps etched into the rock. Fun! Sheltered by steep slopes and spared from loggers, the forest looks much as they did in the days of the Cherokee hunters. The Eastern hemlock are 200+ years old. Inspiration Point is at 2 miles. Stop, rest and enjoy its wonderful views. The Eye of the Needle hole in the rock near the top of Little Duck Hawk Ridge can be seen from the Alum Cave Trail. The Eye is seen best with afternoon sun. At 2.2 miles is Alum Cave. It is actually a rock shelter, an overhang that resembles a cave entrance. In the 1830s, the Epsom Salts Manufacturing Company was formed to mine alum, Epsom salt, saltpeter, magnesia and copperas here. The easily accessible salts were depleted by the mid-1840s. At 2.6 miles is the flat-stoned Gracie's Pulpit that marks the halfway point to Mt. LeConte. It's located on a ridge - so enjoy the brief downhill portion of the trail after you pass Gracie's Pulpit. The trail begins to climb again toward Mt. 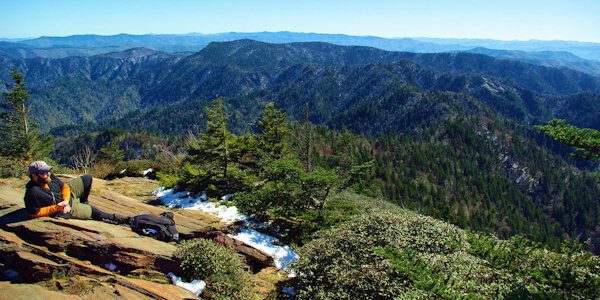 LeConte, with many small water crossings, ledges and overlooks along the way. The last of the ledges passes right beneath Cliff Top. Once beyond this point, the trail flattens out and you enter a spruce-fir forest. 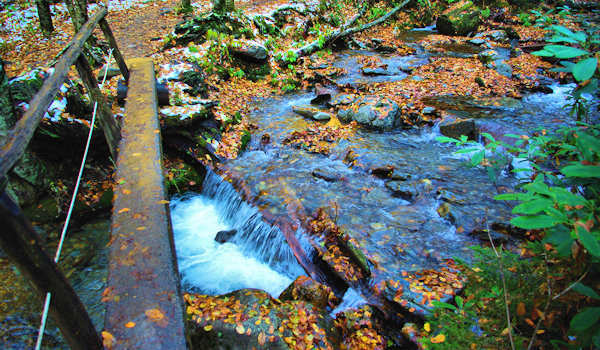 Before reaching the lodge, at just over 5 miles from the trailhead, the Alum Cave Trail ends into the Rainbow Falls Trail. Turn right here. 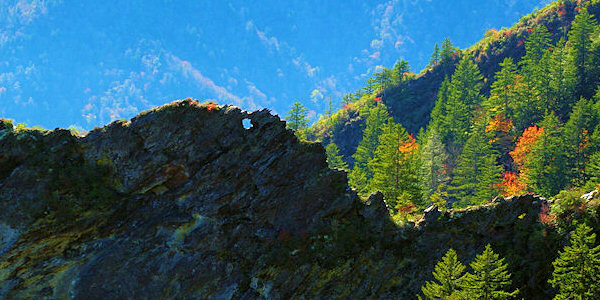 For the panoramic views of the Great Smoky Mountains, go to nearby Myrtle Point or Cliff Top. Cliff Top is the best location for sunset views. It's at the end of a 0.2-mile side trail that starts near the entrance to the Lodge (look for sign along the main trail). 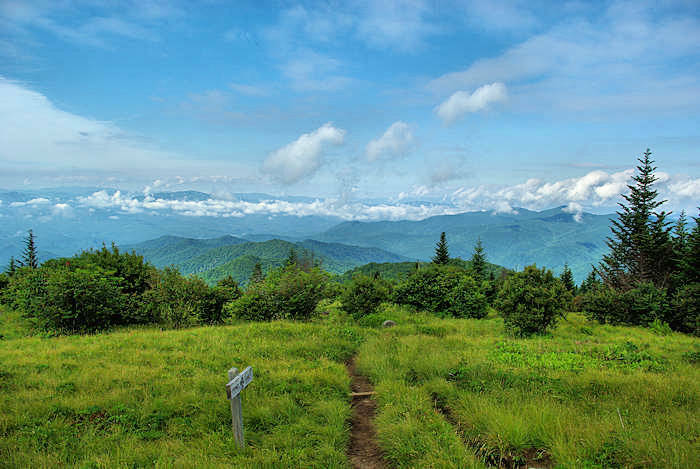 Myrtle Point provides nearly 360-degree views of the Smokies and is the best location for sunrises on Mt. LeConte, about 3/4-mile from the Lodge. To hike to Myrtle Point, walk 0.4-mile on the main trail past the Lodge, which is now the Boulevard Trail. About 0.2-mile past High Top (stack of rocks at the mountain summit) take the fork to the right to reach Myrtle Point, which is another 0.2-mile from this turn. 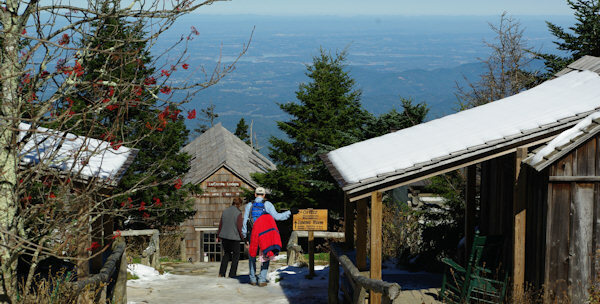 LeConte Lodge is located near the summit at 6,360 ft. elevation and operates mid-March through mid-November. 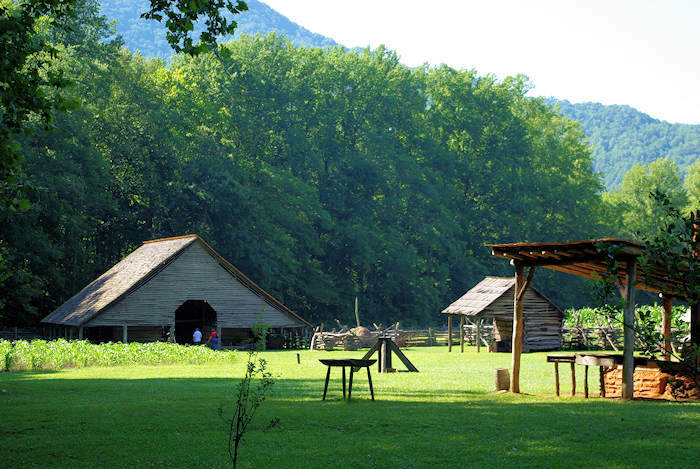 It's the only place in the Great Smoky Mountains National Park where you can sleep overnight on a mountaintop in a snug, permanent structure - complete with hot meals. All rooms for the season are often booked by January. But, you can always add your name to the waitlist in case of cancellations. It has a capacity of 60 guests per night housed in one of the 7 rough-hewn cabins or 3 group sleeping lodges. There is no electricity. While there is a privy building with flush toilets, there are no showers. 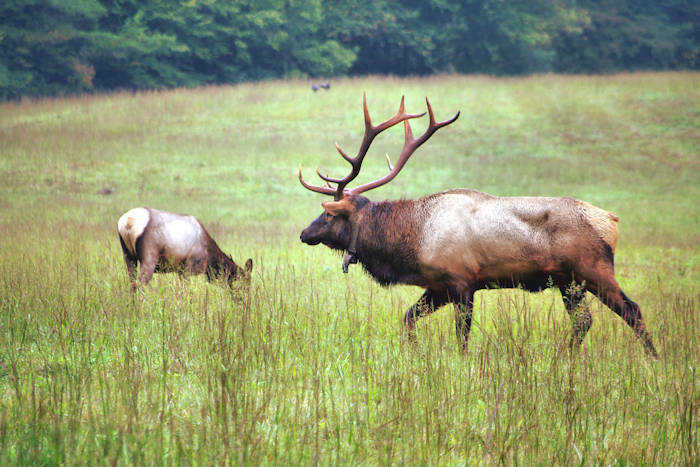 One night at the lodge costs approximately $150/adult, including dinner and breakfast. Call for reservations at 865-429-5704 or go to their web site.